When my youngest child was a toddler he developed a sudden and intense fear of monsters. “I sared! I sared! !” he would say in his adorable little toddler voice, putting his hands over his eyes. It was hard not to smile at the mispronunciation and the almost cartoonish actions that went with it but this was a real fear, a fear that woke him in the night and had him sobbing in terror. We were not sure where the sudden fear of hidden monsters came from, and nothing we did seemed to make any difference. No reassurance that monsters were not real penetrated his fears, and the books we read about kids conquering their fears seemed to be all too old for him. So we decided that the best way to tackle this was to encourage him to play with monsters, to see that they could be fun, and that he could have control over them, and work through his fears. And so we made him some monster puppets! 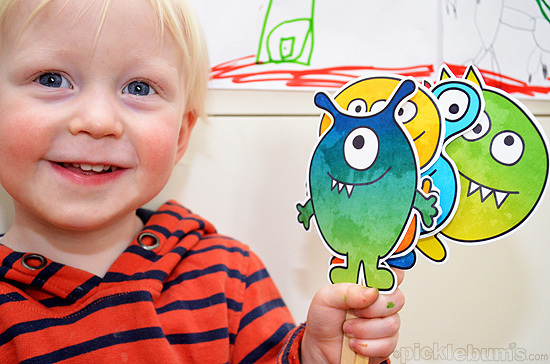 We made five bright and colourful, silly, friendly looking monster puppets for Noah to play with. I enlisted the help of the big kids and big brother drew a fun backdrop for the puppet play, and the big sisters came up with a story that showed the monsters being funny and doing normal every day, not scary, things. We encouraged Noah to chose a puppet and join in the play and at the end of the story we encouraged him to ‘shoo the monsters away’ and we all gave a lots of applause and encouragement when they had all run away. This little monster has purple toes. This little monster plays all night. This little monster is such a fright. We left the monsters out to play with for a long time, and I think they helped ease Noah’s fears a little. And they were loads of fun to play with too! 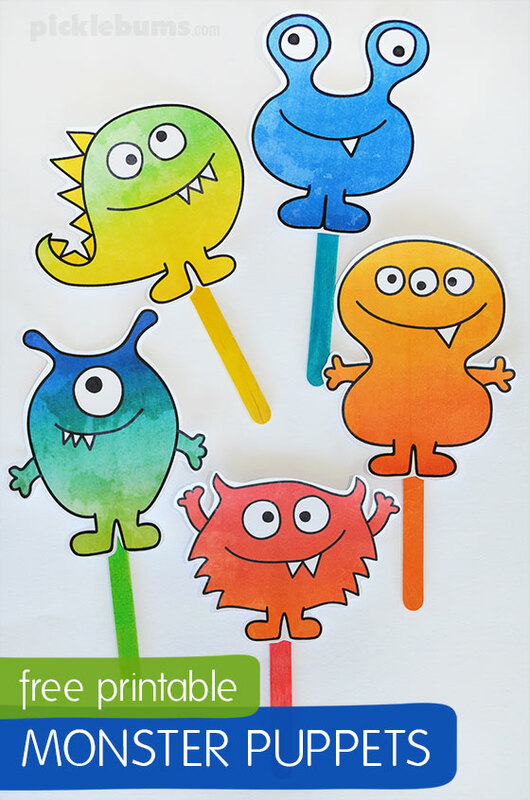 If you have your own monster problems, or perhaps you are celebrating Halloween, or maybe you just want to play with these cute monsters you can print them, cut them out and make your own puppets. 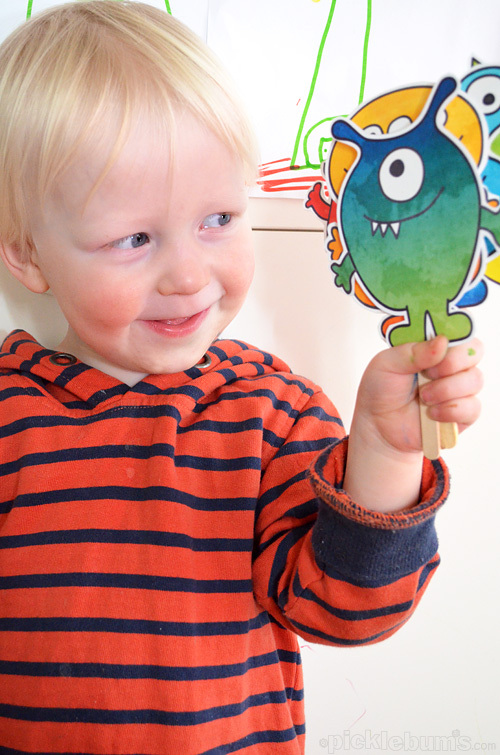 You can download these free printable monster puppets here. Each of these free printables is an A4 sized pdf file. If you are printing on US ‘letter sized’ paper be sure to select ‘fit’ or ‘shrink to fit’ from your printer options. The free printables at picklebums.com are for personal use only, you may not sell, share, or link directly to these files. Are your children scared of anything? How have you dealt with it? 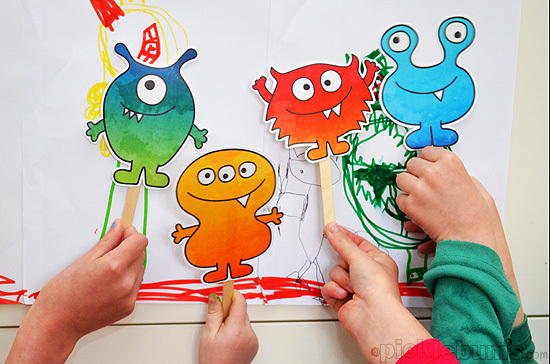 If you like these, then you’ll love our other free printable puppets. Those are freaking adorable! I am so impressed and cannot wait to get some more ink for my printer so I can print them. Wow! Sharing now!! These are great! My son will love them, pinned! Your little monsters are darling! Thanks for sharing them. My kids will love these. Perfect for this time of year! These are great! I really hope that they keep working for your son. We’ve been quite fortunate so far with no big fears, except our middle son was scared of the washing machine when he was little! All resolved by getting him to help me do the washing! Thanks for sharing your printables. These are such adorable monsters. Miss Possum can’t wait to print theses out! These are fantastic! I also have a little boy who scares easily (hates anything in a costume that obstructs view of the head/face, so you can imagine what a challenge Halloween is for us). I haven’t been able to find any friendly monsters – till now. Thanks so much for sharing these! Thanks so much for posting these. These are way awesome! I love the Monsters jumping on the bed idea. So many ideas are running through my head of how to use these. Thanks for the inspiration! Thank you so much, these monsters are brilliant! These are adorable! I can’t wait to print them out! Thanks for the printable! Thank you so much for posting these for print/download. These little guys are too cute! I’m so happy your son was able to conquer his monster fear, it sounds like he has a lot of fun with them now! I LOVE these! I am 67 and a multimedia artisit, and I plan to string these up in my studio! They make me smile with delight! thank you! 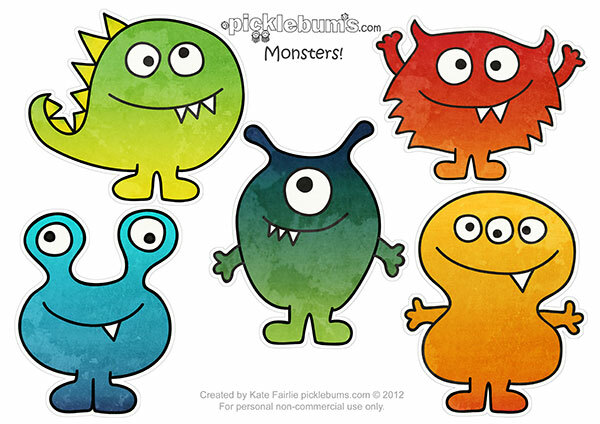 These monsters are adorable! Thanks for sharing! These are perfect! I have one scaredy boy and he’s influencing his little brother. AAHH! I don’t need two of them being scared of ‘the monsters’. Fingers crossed these help. But if they don’t I’m going to print them for me!! I just stumbled upon your website last night and I have fallen in love!!!!!! Thank you!!!! These will come to good use for my son’s monster party. 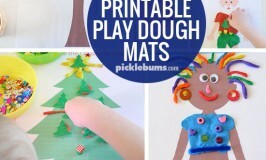 This is the first site I found where not only are the printables great quality, free, and actually easy to print out. — came walking in and one went wild! — came walking in and another one went wild! — came walking in and the last one went wild! Then the children smiled and there were 10 friends to see! thanks so much for your generosity and inspiration! I have a pre-K class and we just love monsters, especially the Ed Emberly books. Thank you for cute monsters that are not scary. Thought of a little song…. I am making my son a big craft box for his birthday with lots of pre-prepped ideas that we can do together. Just wanted to let you know how great your site is and how many awesome ideas you have given me and especially how great the printables are. Thanks!! So glad to hear they are useful! What a great idea for a present! I hope your son has a great birthday. Thank you for sharing! My little girls are going to be thrilled to play with these!! 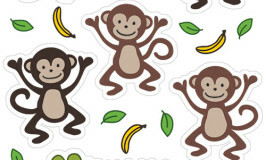 Printable Puppets – Five Cheeky Monkeys… and a Crocodile!